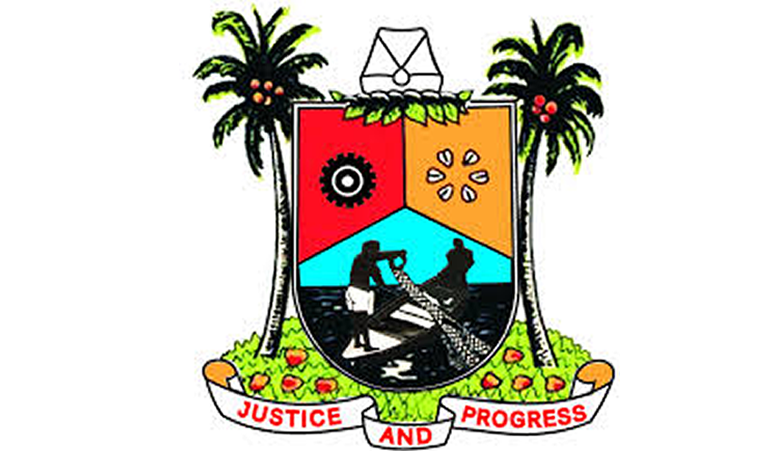 Inaugurating the Committee, Governor Ambode, who was represented by the Secretary to the State Government, Mr. Tunji Bello, said a smooth transition to the next administration was imperative to ensure that the machinery of government continues to run smoothly without any hitch, considering the economic importance of Lagos to Nigeria. 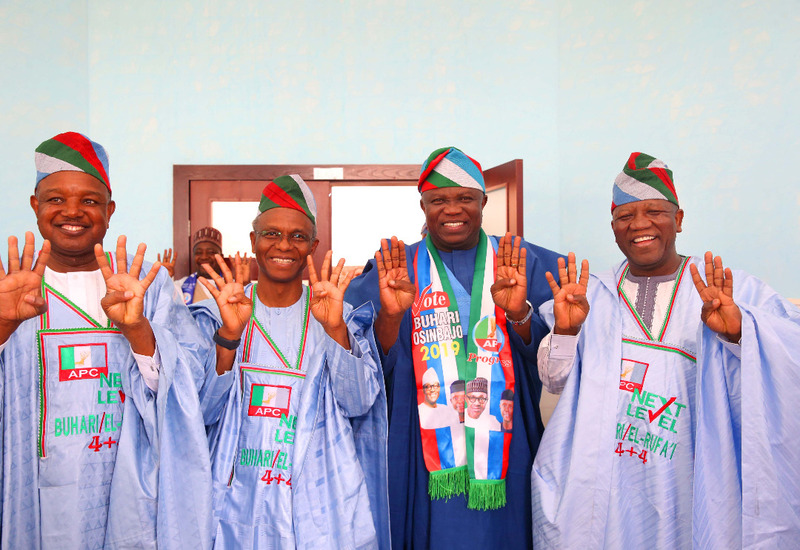 He commended Lagosians for keeping faith with the progressive ideals of the All Progressives Congress (APC) in the last two decades and also his administration, expressing optimism that the incoming administration would build on the achievements recorded so far. 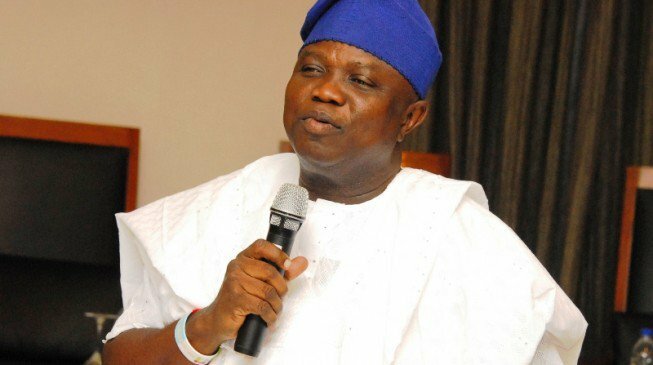 Lagos State Governor, Mr. Akinwunmi Ambode, on Saturday assured President Muhammadu Buhari that residents in Lagos would troop out enmasse on February 16 and deliver the State to him and other National Assembly candidates of the All Progressive Congress (APC). 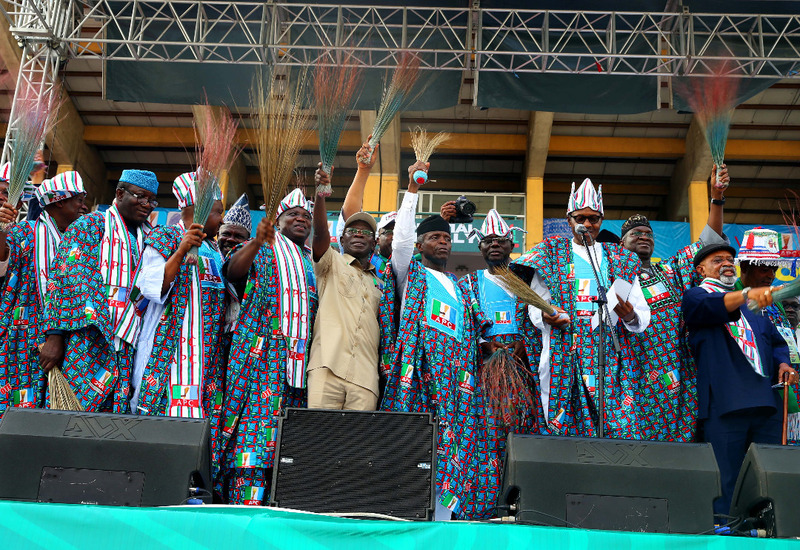 Governor Ambode, who spoke at the APC Presidential Mega Rally, held at the Teslim Balogun Stadium in Surulere, Lagos, said the President in the last three and half years fully supported the infrastructural growth in the State and would do more if given another mandate of four years. 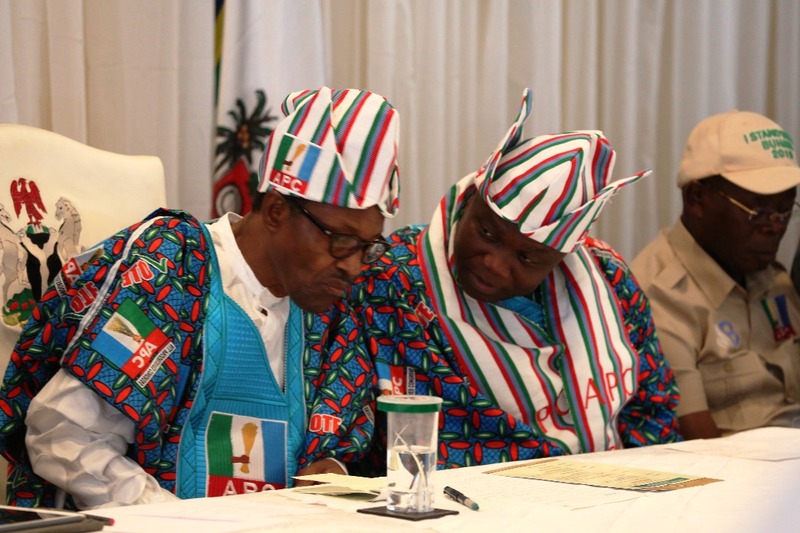 President Muhammadu Buhari, with Lagos State Governor, Mr. Akinwunmi Ambode and National Chairman, All Progressives Congress (APC), Comrade Adams Oshiomhole during PMB meets Organised Private Sector, at the Lagos House, Marina, on Saturday, February 9, 2019. 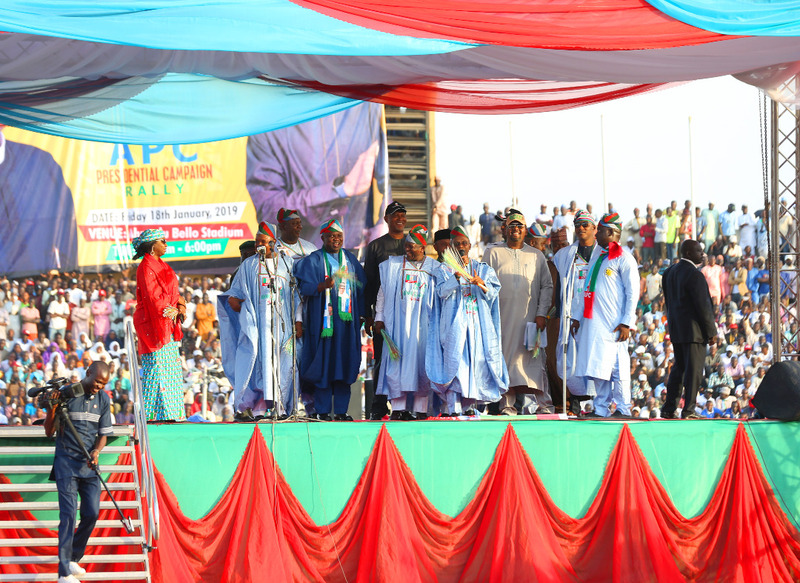 “In and outside of the stadium, you can see the crowd that has turned out here and we are very grateful that Lagos has been signed, sealed and delivered to APC already. The message is very clear. 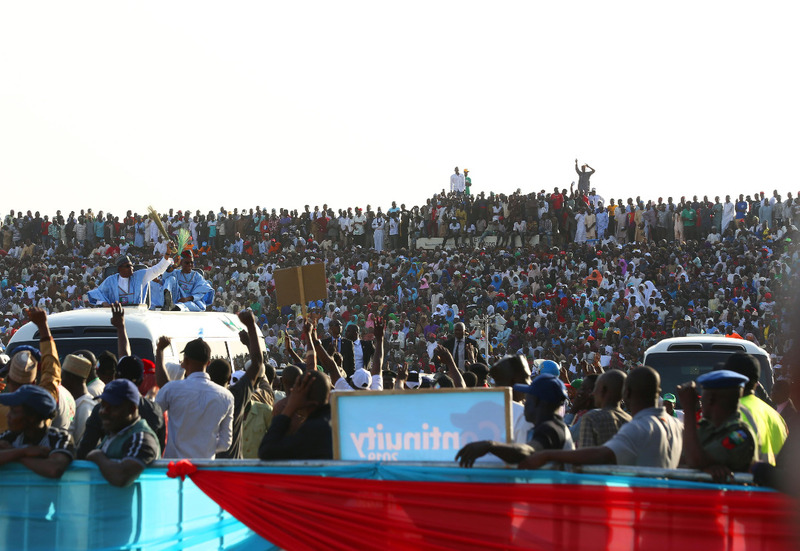 “if you see what we are going in Lagos already, you will see that the Airport road is not for the Yorubas or the Igbos or the Hausas, its about making life comfortable for Nigerians and that is why Mr. President has continually supported all our projects by even refunding some of the funds we used for capital projects so that we can complete more projects,” Governor Ambode said. 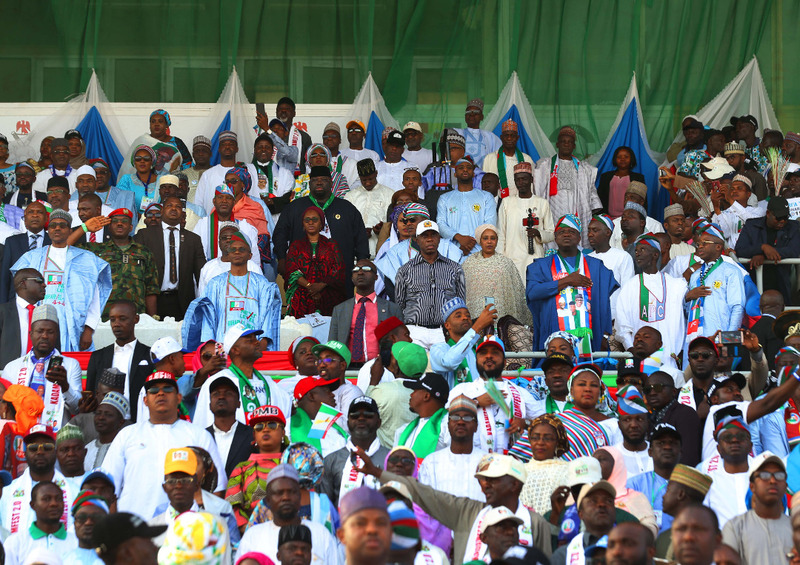 Kano State Governor, Alhaji Abdullai Ganduje; Oyo State Governor, Sen. Abiola Ajimobi; Lagos State Governor, Mr. Akinwunmi Ambode; Senior Special Assistant to the President, Mrs. Adejoke Orelope-Adefulire and Governor Atiku Bagudu of Kebbi State during the President’s arrival for the APC Presidential Rally at the Presidential Wing of the Murtala Mohammed International Airport, Ikeja, on Saturday, February 9, 2019. 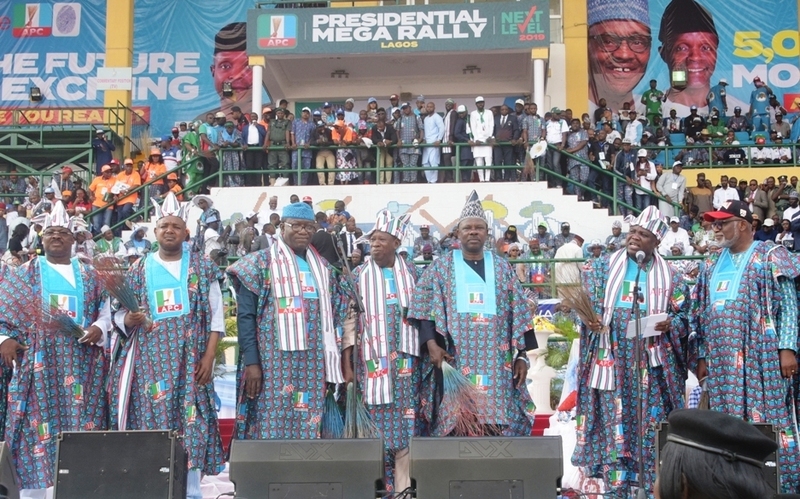 The rally was well attended by the who’s who in the APC including the Governors of Ogun, Osun, Oyo, Ekiti, Ondo, Edo, Kano, Kebbi, National Leader of the APC, Asiwaju Bola Ahmed Tinubu; Mr. Babatunde Fashola, other serving and past Ministers, party chieftains, among many others. 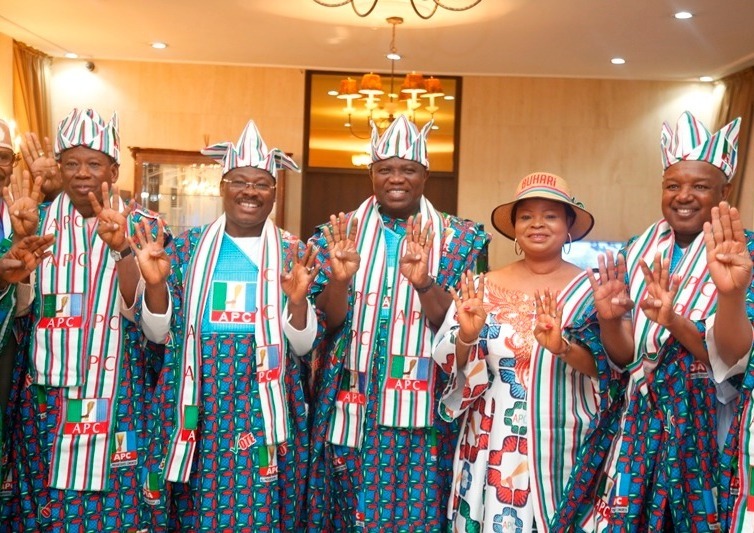 The State Governor, Mr. Akinwunmi Ambode, who said this while receiving NIWA’s Managing Director, Senator Olorunnimbe Mamora and top management staff of the agency on courtesy visit at Lagos House in Alausa, Ikeja, said putting the perennial conflict between NIWA and LASWA behind was the most patriotic thing to do, and that it would also in the best interest of all, especially the economic prosperity of the people.